Show number two, we meet Marcia, a retired, US Air Force senior master sergeant, whose daughter wrote the show asking for a new look for her mom. Being that Marcia lived in fatigues, she needed a lot of help in the wardrobe area and that's where the gals at Carabella in Oakmont, lended a hand. Next stop was the Salon at Saxonburg, where owner Tom Beckes gave her a new modern cut and freshened up her color. Makeup artist, Patty Bell was on hand to offer Marcia some help with her rosacea, and suggested the right colors for her to use to achieve a natural makeup look in her every day, civilian life. Marcia absolutely loved her new look and couldn't believe how young and glamorous she looked! Host, Kym Gable interviews Marcia about her new look! Thank you, Marcia, we enjoyed meeting you and making you even more beautiful than you already were! A show that not only helps women look good, but, more importantly, feel good, too! Our mission is to transform womens' lives and empower them to be their very best, no matter how bleak their circumstances or dire their needs...our award winning team of experts are here to help make over Pittsburgh,(and beyond), one face at a time. In episode one, we meet Bonnie, a cancer survivor, caretaker, wife and women who does so much for others, but never takes the time for herself. 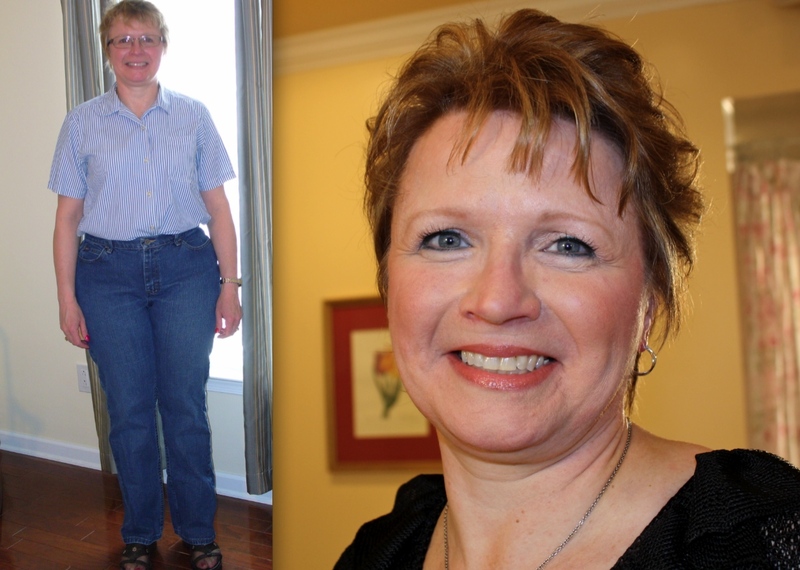 She lost 156 pounds from a gastric bypass surgery, yet still dresses the same way before her weight loss surgery. 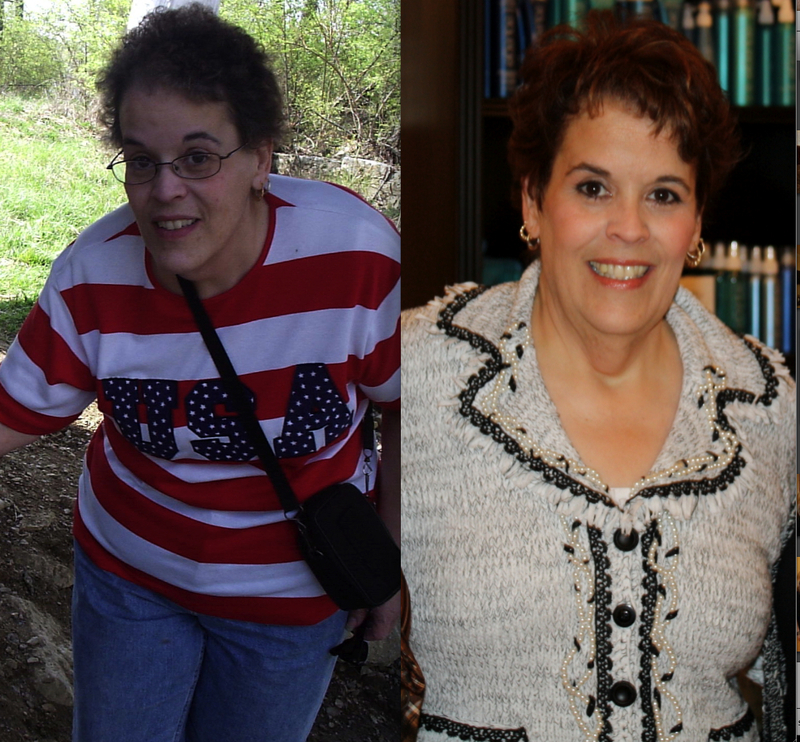 Bonnie was ready for a change, so she contacted Makeover Pittsburgh. Bonnie arrived at the Salon at Saxonburg, ready and eager to get a whole new look...armed with a Ziploc baggie of makeup, and her old Santa sweatshirt in hand! And, our team of experts were ready for the challenge. With some new makeup techniques from makeup artist, Patty Bell, a new hairstyle from Tom Beckes, and brand new wardrobe donated to her from Carabella in Oakmont, they were able to bring out a whole new beautiful Bonnie, hidden under all that baggy clothing! Look at the joy in Bonnie's face after her makeover! Her family was there to witness the big reveal and all were brought to tears with Bonnie's amazing transformation. No more striped shirts for her! We think she looks incredible, but Bonnie was already beautiful, she just needed a little help in the right direction! Thank you Bonnie...you are just as beautiful on the inside as you are on the outside! We loved meeting you and your family! You are such a blessing to all. Bonnie's family LOVES her new look! Kym gives Bonnie back her old sweatshirt, that used to be her husbands underwear at one time! If you are in need of a makeover, or know someone who is, please email us at makeoverpittsburgh@gmail.com, and tell us your story. You just might be the be the next show! Makeover Pittsburgh is coming to a neighborhood near you! A show that not only helps women look good, but, more importantly, feel good, too! Our mission is to transform womens' lives and empower them to be their very best, no matter how bleak their circumstances or dire their needs...our award winning team of experts are here to help make over Pittsburgh,(and beyond), one face at a time.